Electric cars are “competing with 150 years and trillions of dollars spent on gasoline cars”. So says Elon Musk, the outspoken CEO of electric car manufacturer, Tesla Motors. CCC analysis shows that the UK needs 60% of new cars and vans to be electric by 2030 to meet our 2050 climate change targets, but with this figure currently at less than 1%, there are big public perception barriers to overcome. In the Government’s 2014 Public Attitudes to Electric Vehicles survey, 56% of respondents said they hadn’t thought about buying an electric car, with 40% stating that range and recharging would discourage them from purchasing one. One of Tesla’s stated aims is to “increase the number and variety of electric vehicles available to mainstream consumers by serving as a catalyst and positive example to other automakers”. They hope to do this partly by solving the problems of range and rapid recharging, but also by raising awareness of the technology through their luxury branding. 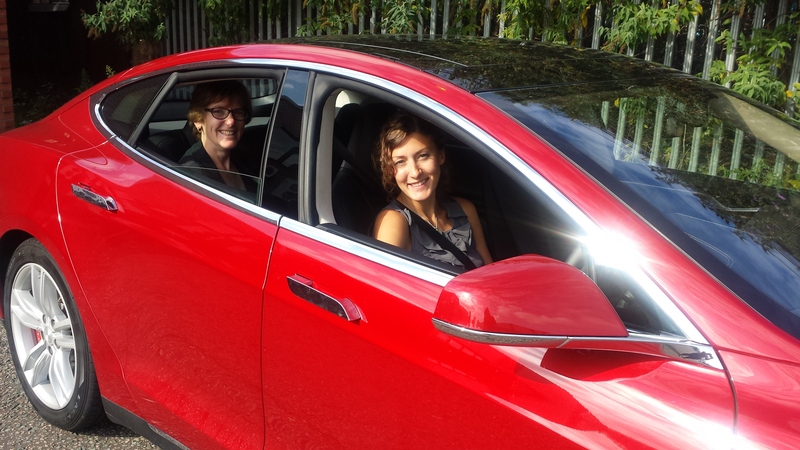 Recently, some of the CCC secretariat visited the Tesla Motors showroom in West London to take their Model S electric car for a test drive. We drove out through crawling London traffic and then picked up a bit of speed along the A4, finding the accelerator and brakes very responsive. The only way the driving experience really differed from a conventional automatic car was the regenerative braking, which kicks-in when you take your foot off the accelerator, allowing the battery to recover energy through slowing down, making it super-efficient. At the end of our test drive the sales rep took over to demonstrate the Model S’s rapid acceleration. The g-force made for sharp intakes of breath – blowing away any preconceptions we had about electric cars being feeble and slow. The Model S is a “full-size luxury sedan” with a full-charge range of around 250 miles, considerably higher than most electric vehicles currently on the market. The 85kWh battery fills the bottom of the car’s chassis, but this leaves space for storage at both the front and rear of the car. Tesla also provides Model S owners with free access to their growing network of “superchargers”, which can fully charge the battery in one hour. These range and recharging capabilities have apparently helped to overcome some of the public perception barriers, as there is a waiting list to buy a Model S until early 2015. Tesla are looking to increase their capacity to manufacture existing models, but are also looking ahead to the next few years when they plan to launch a range of new vehicles, including more affordable models. The price tag of a Tesla car puts them outside most peoples’ budgets, but an increasing variety of electric cars is becoming available to UK consumers who are ready to make the switch. In the CCC’s 2014 progress report, we showed that a wide choice of vehicles, at different prices and with different range capabilities, has been launched on the UK market. The most popular models in the UK are currently the Nissan Leaf, the Toyota Prius PHV and the Vauxhall Ampera. With a Government grant scheme offering 25% off the cost of a car, up to a maximum of £5,000, purchasing an electric car is becoming a realistic option for many consumers. This blog was written by Dr Jack Snape, Senior Analyst – Surface Transport.